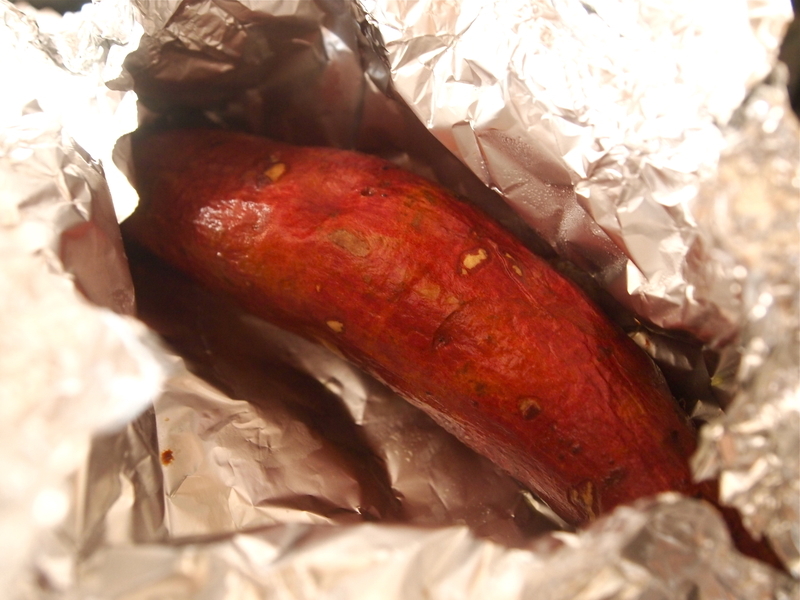 Last week I tried my very first Japanese sweet potato, known in Japan as Satsuma-imo. I’m already a big fan of the standard orange fleshed variety, but I was fancying something a little different so I thought I’d give these ones a shot. Aesthetically they look lovely! 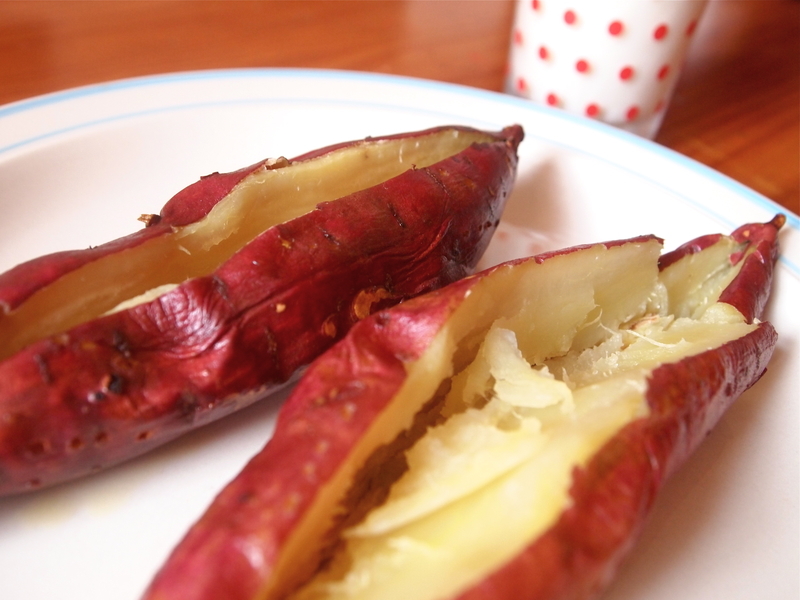 The skin is a nice vibrant reddish colour with slight traces of purple and they have a creamy white interior. I wanted to cook them very simply this time so their true flavour would shine through without any distractions. All I did with these little babies was preheat the oven to 180°C, wash and dry them, then loosely wrap up each potato with a small splash of oil in some tin foil. You can also add a pinch of salt if you feel that way inclined, or just leave them as is like I did. Make sure you scrunch the seam of the foil up nice and tight though so none of the moisture escapes. This moisture helps steam the potato cooked, but because it’s being baked in the oven the base gets a little bit crisp and chewy! The best bit! Put your litte foil parcels on a baking tray and bake them for around 45 minutes to an hour. 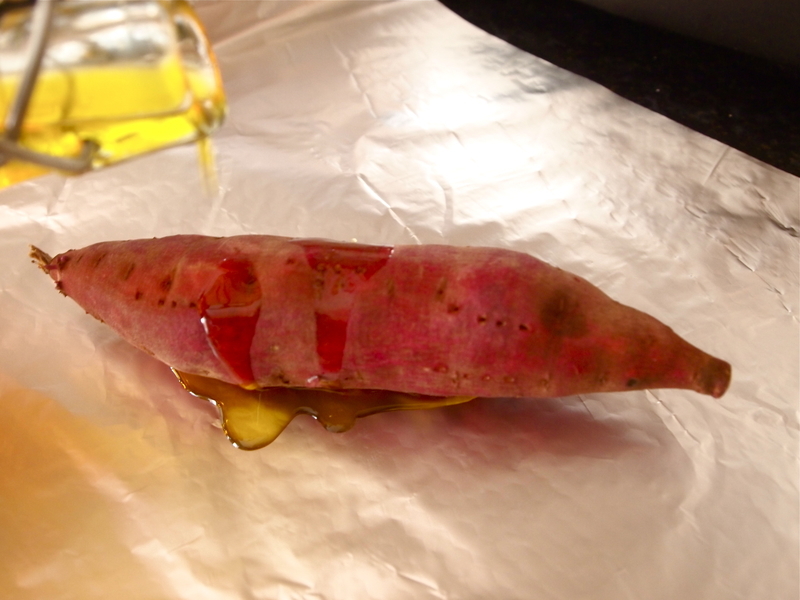 The cooking time will vary a bit depending on the size of the sweet potatoes and how hot your oven gets, but just check by piercing them with a knife and if they seem soft and the knife goes in with very little resistance then they’re done! The first one I had I ate completely plain so I could appreciate the flavour for what it was, and it is by all means a natural beauty! It was lovely and sweet and had a slightly drier texture to the usual orange fleshed kind. Not in a bad way though. It actually made it taste reminiscent of chestnuts, which I love, so that was a very nice surprise! No. 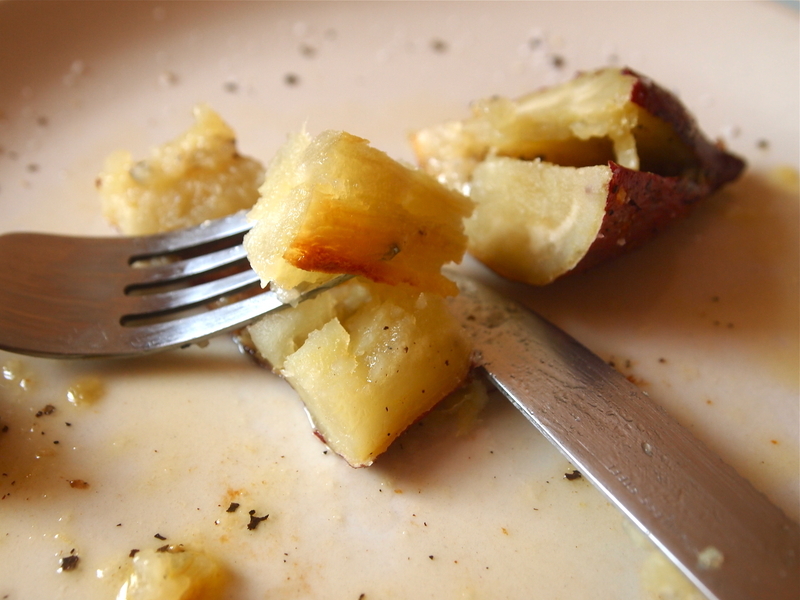 2 was enjoyed with a slick of butter and salt and pepper! Both tasted good in different ways. I’m pretty sure Satsuma-imo connoisseurs in Japan who buy theirs fresh from the market, plucked straight from their garden or from street vendors who cook then bury them in gravel to retain their moisture, would consider putting anything on top of these beauties sacrilege! I do agree though, they don’t really need anything, except maybe a glass of milk to drink alongside which I hear is traditional? I never thought Japan, or any Asian country for that matter, was a country of milk drinkers. I digress. As I was saying, they taste amazing all on their own. If it went on the X-Factor, it would be one of those contestants that are just naturally really good and unassuming – no gimmicks, flashy lights or manic cheesy backing dancers necessary. Let’s face it though, it would get kicked out. The best ones always do. 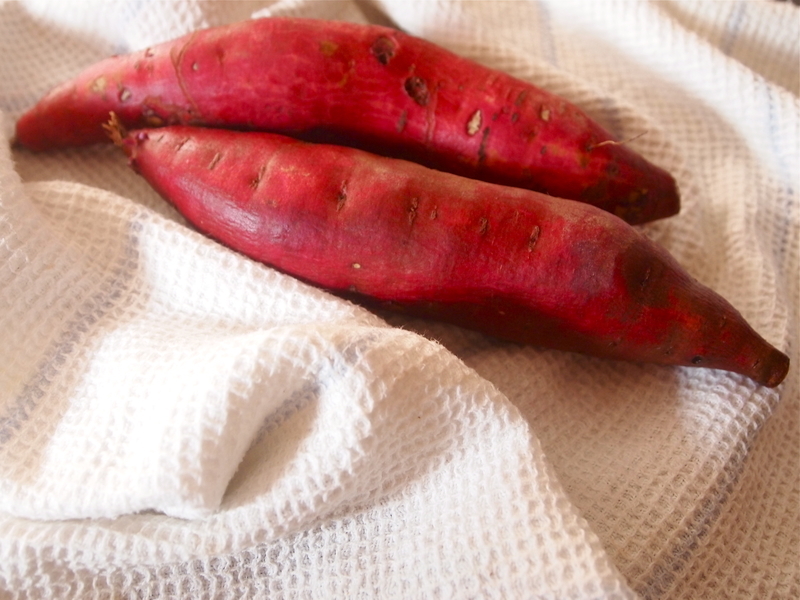 So, maybe I’m just going through a phase, but these tasted like the best sweet potatoes I’ve ever had. I’ll definitely be picking up some more next time I see them. • I used a nice cold pressed Irish rapeseed oil that’s produced by Derrycamma Farm in Co. Louth to drizzle on top before baking. It has a subtle nutty flavour that I really like, but it is quite mild so use whatever you have at hand, whether it be olive, groundnut or sunflower oil, they’ll all work just as well!